Class Play Season at Orchard Valley! 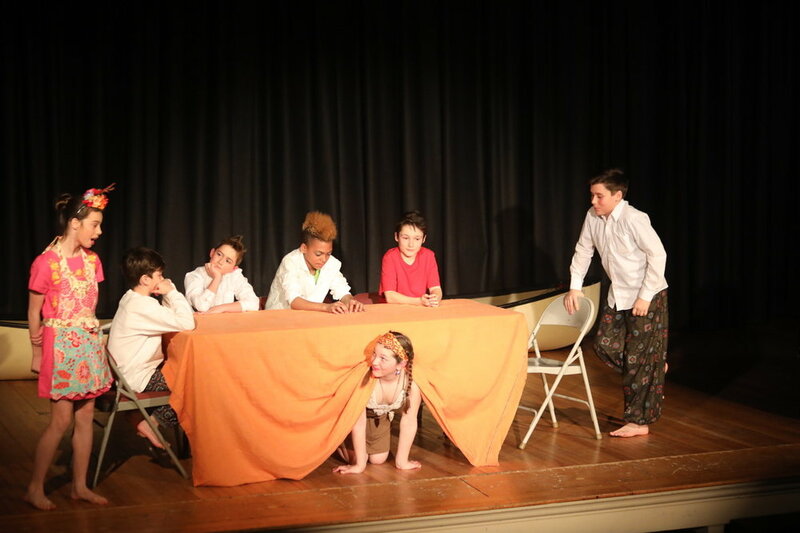 From 3/4 Class Teacher Libby Case: As is the tradition in many Waldorf Schools around the world, each year class teachers at OVWS produce a play with their students that is performed for the student body and for parents and friends. It is a social art which is shared with the whole community. * Class plays offer the opportunity to build the social strength of the class. * The subject matter of the play often reinforces the curriculum content of the year. * Identifying ones self with a character helps build empathy in students. * Acting develops skill and capacity in students. * The play helps strengthen the sense of independence in the whole class, as they often have to direct themselves back stage and get themselves on and off stage at appropriate times. * Creating a play as a class involves artistry on many levels, from scenery creation, costuming, singing, and dance and movement. * Teachers often develop or utilize the characters in the play to help address specific strengths in individual students. Class 3/4 and 5/6 both performed for the community this month. Class 3/4 performed a Norse Myth, “The Death of Balder, the Most Beloved of Norse Gods,” a play created by Waldorf teacher William Ward and directed by Class teacher Libby Case. Students performed in the Cloth Yurt on Campus for the student body in the morning and for more than 50 friends and relatives in the evening. It was a smashing success! Class 5/6 performed "The Whale Rider," the story of a Maori girl who fights to fulfill her destiny as leader of her tribe. The book was written by Witi Ihimaera and adapted for the 5/6 Class into a play by their teacher Claudia Reinhardt. The students gave a fantastic performance at the Plainfield Opera House. For many of them, this was their first time performing on an actual stage. 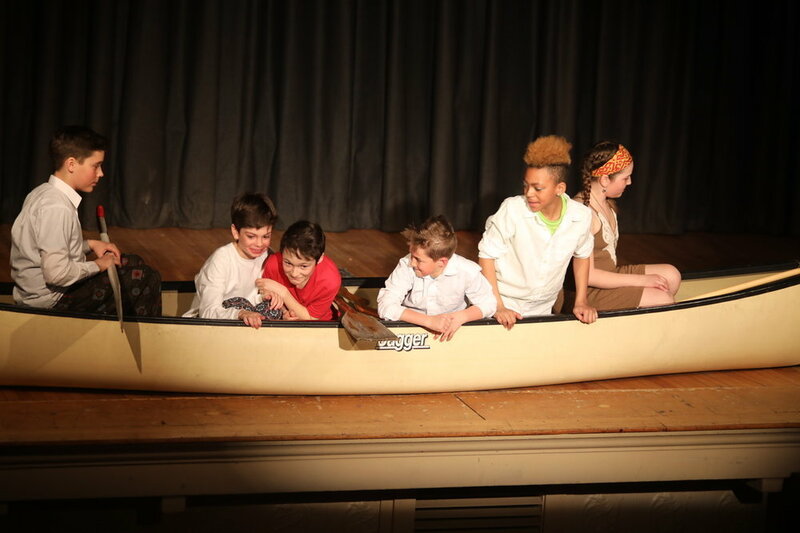 Grade 5/6 Class Performs Class Play: "Paikea-A Modern Tale"
From Class Teacher Claudia Reinhardt: On March 14th and 15th, the nineteen students of Class 5/6 performed their class play, "Paikea - A Modern Tale," for families, friends, and fellow students at the Plainfield Opera House. Ten years ago, I had the opportunity to travel to Christchurch, New Zealand where I observed a class at the Christchurch Steiner School that was listening to Maori stories told by their teacher. I was fascinated by the stories, purchased a book at a local bookstore that afternoon, and have since incorporated these wonderful stories into the curriculum I bring to students. The Bay School Model, which we have adopted as a school, especially makes this creativity possible. The class play was inspired both by the story of Paikea as well as Witi Ihimaera's book The Whale Rider, which I read to the students back in the fall. The play told the story of a girl, Pai, whose grandfather does not want a girl to become the chief of his tribe. It also tells, in monologue form, the story of a young whale who loses its mother to whaling. Grief-struck, it journeys to Antarctica and eventually beaches itself in order to seek death. A meeting of the whale and Pai takes place, revealing to all that she is an honored descendant of Paikea, the ancient whale rider himself, and a worthy leader of her tribe. The play opened with a scientific look at whales. Did you know that whales used to be dog-sized, land-roaming creatures? Did you know that two spacecraft launched in the 1970s contain a copper record with recordings of whalesong? 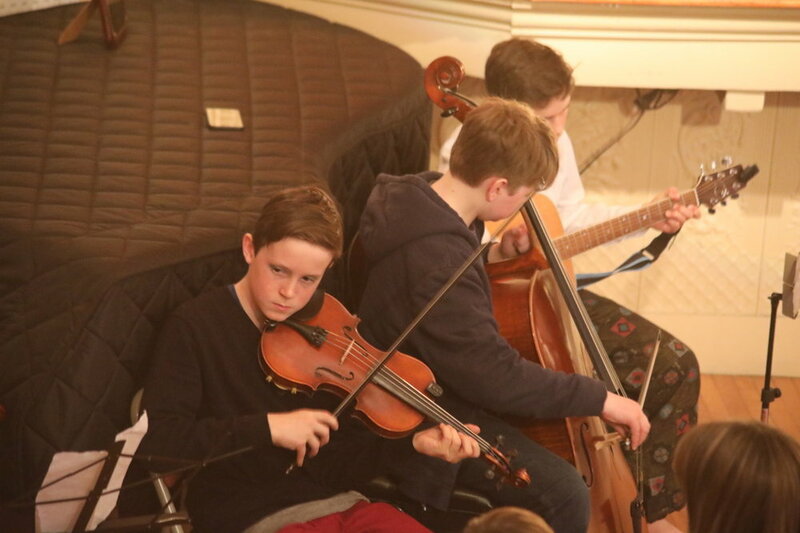 5th and 6th graders performed an energetic "Ka Mate" Haka as part of the play, and students on violins, cello, and guitar played beautiful interludes of a whalesong piece. It was a meaningful experience for the students and they received many compliments for their outstanding performance. Click on the photo to advance to the next. In the last few decades, there have been many articles relaying research that tie movement with brain development as well as brain function. One of the main reasons cited for this connection is that movement leads to an increase in blood flow to the brain, supplying more oxygen along with hormonal molecules which stimulate brain growth and increase energy for functional processes. Movement classes at Orchard Valley Waldorf School reflect an Anthroposophical approach, which coincides with the scientific research. I utilize my training in Spacial Dynamics physical education training and I strive to always address the principles of head, heart and hand, also known as thinking, feeling and willing. In the first part of the class, when the student is fresh and has the energy to focus, we direct our attention to the thinking realm by doing conscious movements by practicing different Bothmer exercises, which were developed by Graff von Bothmer under the influence of Rudolf Steiner. In doing these exercises, the participant must bring to consciousness where their limbs are in relationship to the rest of their body. With practice a true balance is instilled, the skeletal and muscular systems are working efficiently and stress on the joints is reduced. The second part of each class addresses the will forces, and here the students practice skills such as juggling, jumping rope, mat work, etc. In the case of juggling, for example, it takes patience and determination to learn such a skill. There are moments of frustration and one can almost give up when suddenly a breakthrough happens and juggling is happening! This stick-to-it-ness strengthens the will. The last part and the longest segment of each class involves playing games that mainly relate to the feeling realm; this is where the social interaction between students comes into play. Emotions can be high at this time, and some of the questions that bring about disputes while playing games include “Are the teams fair?” “How about the refereeing—are the players honest?” Sometimes emotions run so high that everything has to come to a halt while we discuss the situation, which often pressures the different sides to resolve quickly and compromise. Games such as Spaceball, Team Handball, Frisbee, forms of Capture the Flag, Dodgeball, or Prisoner Base all utilize the habitual movements formed in the thinking section of the class, as well as the skills practiced in the willing part of the class. Although the student is mainly addressing the thinking forces during the Bothmer exercises, the feeling and willing forces are also engaged to a lesser degree in the process of improving the movement of the exercise. The same is true for the skill section, where thinking and feeling plays more of a minor role, and in the games section in which thinking and willing are in the background presenting a holistic approach to movement. As far as academics are concerned, when a student is active the result is an increase in the ability to focus. Humans have what is known as the midline barrier, an imaginary line that runs down the center of the body in early childhood. This line, for the young child, is hard to cross with their arms and legs. But as they grow older, crossing becomes easier and easier with the practice of different everyday crossing movements. Then this immature movement pattern is gradually integrated, helping to provide a sound foundation for physical and academic work. This crossing is important because when the child begins to read, the eyes have to cross the midline on every line on the page. Many children who have trouble reading have trouble crossing the midline. Let’s look at how movement class might improve this for the child by taking a look at a skill such as juggling. Each time the ball is tossed it crosses the midline and then has to be caught, which strengthens the midline crossing foundation that has already been laid down. As the ball travels through the air, the eyes track the path and somehow the brain tells the arm and hand where to move to be able to catch the ball. Better known as eye-hand coordination, this activity integrates physics into the body by tossing a projectile into the air and instantly knowing where it will land when practiced over and over. Along with all we now know about the science of movement and its affects on brain development, let’s not forget the joy! There is a joy in learning new movement skills and being able to apply them in playing games. Fred Rogers described it best: “Play is often talked about as if it were a relief from serious learning. But for children, play is serious learning. Play is the work of children.” This is not only true for the young child, but also for the older students as it provides the needed foundation for academic learning. From French Teacher Madame Harper: At assembly last week, the 7th graders shared a French poem written by Leopold Senghor, a Sénégalese poet and the 1st African president of the Republic of Sénégal (1960-1980). Earlier this fall, the class studied French-speaking countries in Africa and, along with their projects, we learned this poem titled Cher frère blanc (Dear White Brother). Leopold Senghor asks a very important question in his poem: who is really the man of color? He muses about why white people call black people "colored," when there is a huge range of observable colors on white people's skin. With a touch of humor, the author successfully delivers his message and still touches the hearts of people many years later. His goal was to undermine prejudice and draw attention to our common humanity. When I die, I will be black. When you die, you will be grey. Who is the colored man? Q. What drew you to the U.S. and Orchard Valley? I had never heard of Vermont before meeting my husband, Seth! When I came to visit Orchard Valley, I had a tour of the campus with Madelief. It was lovely and the campus was beautiful, and Madelief was so nice. We knew we wanted to move to Vermont to be near Seth's family. Q. Can you share a little about your experience here? This place has been my life here in Vermont. The faculty have become my family, friends, and community. It's been a big adventure professionally. It was my first time teaching in a Waldorf School--I'd always taught in public schools. It's beautiful being here and connected to the seasons through all the things that we do, and also learning about Vermont culture--like tapping maple trees. It was something everyone here knows how to do, but I had to go home and Google how to tap a sugar maple! I've really felt privileged to follow the group of children I have, to form a class and follow them through these years as they grow and learn so much--from before they could write their names to now when they can write a whole lot more! And also to be on the parents' journey as well. Q. Can you tell us what your plans are after your move back home? I will be teaching at Te Ra Waldorf School on the Kapiti Coast on the North Island of New Zealand. It's a 10-minute walk to the beach. I'll be reconnecting with friends and family and we are hoping to tap into the organic scene (composting and farming) as well. We'll also be waiting the arrival of a best friend's baby and hopefully be taking long walks on the beach with our dog! Q. What are you most looking forward to in New Zealand? Seeing my family, swimming in the ocean, and eating summer fruits. Q. What will you miss about Vermont, the U.S., and OVWS? A big thank you for welcoming me into the community and having me be a part of it all for this time. Look me up if you are ever in New Zealand or need tips on where to travel! From parent Nancy Bruce: “It is such a gift and a blessing to have had the love, calm, care and skills that Svenja brought to all her students. Ava and Esme thrived under her attentive and nurturing nature. We three will miss her deeply and wish her all the best as she follows the direction of her heart." Q. How would you describe Eurythmy to a parent who has perhaps heard of it, but is not exactly sure what it is? Eurythmy is a movement art brought in Waldorf Schools for children to enter—through movement—into what they're learning in their other classes. Eurythmy movements themselves come out of the movements of the formative forces of speech, and that is the beginning—the word. In turn, Eurythmy helps to balance the formative process of the child by bringing the right gestures at the right times, and the right soul experiences at the right stages of development. This supports the specific pedagogy in Waldorf Education that is matched to the archetype of each age of development. It takes the active teacher and Eurythmist to try to perceive where the children are and how the world is impacting them. Out of this, we strive to bring the right Eurythmy gestures to help support what they're going through in their development and what the world is bringing them. Q. Why do we bring Eurythmy to children? Eurythmy brings into movement what children are learning; it is not conscious, it is through a story, fairy tales, poetry, music. To give a concrete example of what this looks like, if a class is studying Greek history in the 5th grade, one would bring the peace and energy dances, given by Rudolf Steiner, based on the Greek Temple dances. Students enter these movements of the Greek people and have an experience of what they were striving for at that time. The mystery behind it, in this example in particular, is that this history has a great relationship to our lives at this point in time, namely, the coming together in a circle as a group of people and the social element that one is not on their own. The energy dance works with the anapest (short-short-long) rhythm, a calling up of energy or fire right in the center of each person, a calling to rise in a way. The peace dance brings in an element of love, also through this anapest rhythm. The Greeks used this in the Temple dances before going out to battle. It was a different battle at that time, but today in educating the child, the task is to provide the child a basis for which to stand in the world. Q. What drew you to Eurythmy? I felt as though Eurythmy was the call for me to stand in the world out of truth and out of goodness, out of something higher than what I'd known. To move with other people where the beginning place is always out of one's heart gives me hope that one can rise out of the darkness, that we can really lift our souls through art. Q. What training does a Eurythmist complete? Eurythmy Training was first brought as a seven-year study program by Rudolf Steiner. Now most schools are four years. We meet four days a week, 8-10 hours a day. Classes include speech eurythmy, tone eurythmy, speech formation, studies of anthroposophy, painting, singing, music theory, and even some anatomy. A teaching practicum in the 4th year and Eurythmy performances are also part of the training. From OVWS parent Lydia Russell: On a chilly and gray November day, a group of parents gathered in the yurt at Orchard Valley to experience the expressive art of Eurythmy. Eurythmy is often presented as a performance art, but also has educational and therapeutic applications. Chloe McKenna, a student of Eurythmy who is currently doing her practicum at Orchard Valley, guided us in a series of warming and enlivening movements and gestures that gave us a small taste of this elegant and intricate form. In her long flowing gown, Chloe led us in simple, yet powerful, movements which invited us to inhabit the space around, between, and within us in an intentional and conscious way. As we moved in harmony as a group, a calming and contemplative energy permeated the room and I could sense the healing and connective potential of such a practice. Chloe explained that Eurythmy offers a gesture for each vowel and consonant in human language, and led us through several examples. She then asked for the names of some of our children and together we made the gestures that correspond with the sounds of their names. This was a particularly powerful moment as we experienced the felt sense of each child through the full-body movements of their names. I was moved almost to tears as I felt the energy of my daughter's presence so fully expressed in a few short movements. We also had the opportunity to work with copper rods, an exercise which took great concentration and awareness of self and other. I could see how empowering and strengthening this work would be for children! For me, the whole experience of moving together as a group in such a mindful and embodied way was a joyful and nourishing one. I felt grateful to get a flavor of the beautiful work Chloe is bringing into our children's classrooms. It is a wonderful gift to have her visit our school and share these teachings. Thank you, Chloe! From Class 4/5 Teacher Claudia Reinhardt: During the last two weeks of school, 4th and 5th graders learned about pre-modern Japan in order to have a solid background for the summer reader they were assigned, The Heart of a Samurai by Margi Preuss. Students learned about Bushido, the virtues required of a Samurai, the history of pre-modern Japan, and whaling. To enliven their studies, students visited Setting Sun Teahut in Plainfield, VT, an authentic Japanese tea hut, for a Japanese Tea Ceremony. Students followed a certain hand-washing and mouth-rinsing ritual before walking the stone path to the entrance of the hut. There they removed their shoes. The entrance is a small, low door that requires one to crouch down on knees and scoot through. There were many feuds in Japan when the tea ceremony came into being. Weapons needed to be left outside the tea hut and everyone, whether peasant or emperor, had to humbly crawl through the same tiny space to enter, creating a sense of equality—at least for the time of the tea ceremony in the hut. As you first look up after crawling in, there is usually a beautiful scroll and a simple flower. We enjoyed thick tea from a bowl that was being passed from person to person (with a certain ritual to clean the rim before passing it on), as well as a cup of Matcha. What a Zen way to end a beautiful year with this vibrant group of students! Click on each image to load the next in this gallery of images. 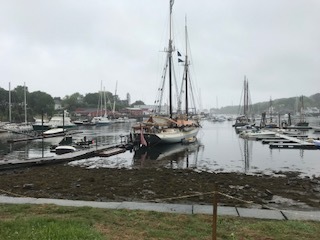 From Mary Fettig, Class 2/3 support teacher and chaperone on the 8th grade trip: On Monday, June 4th, 13 intrepid Grade Eight students along with four chaperones traveled to Camden, Maine and boarded the schooner "The Mary Day" for a four-day sailing adventure in the Penobscott Bay. After a brief orientation on what to expect and how to assist, there was a tour of the ship, bunks were assigned, dinner was served, and the adventure began! The Mary Day, named after the wife of the man who designed, built, and owned the schooner, is a windjammer. It was designed to be a passenger ship that would be sailed along the Maine Coast much like the ships that once carried lumber, granite, and fish long before roads and rails were laid down. The class immediately took to life on a boat. Students were divided into three groups that rotated through and learned about navigation, compass and chart reading, knots and lines, setting and striking the sails, and more. The class took responsibility for steering the vessel, assisting in the galley, keeping the ship tidy, and being full members of the crew. The Mary Day is owned by Barry King and his wife Jenn, former students of Libby Case and Ben Williams when they were teaching environmental science while touring the US in an old school bus! The crew of six was a wonderful collection of interesting and knowledgeable people who were incredibly open and willing to share their love of sailing and life on a schooner. The OVWS class is ending their school journey with open eyes and hearts to yet another way of life and what it takes to have the courage, discipline, and spirit of adventure needed to partake of a life at sea. Thanks to all who made this possible; it was a trip to remember! Click on the image to bring up the next one in the gallery below. Grade 8 Presents Their Projects! The 8th graders presented their individual student projects to the school the Friday before April break, and the depth and breadth of their work was just stunning to see. As the parent of a 2nd grade student, I only know some of these "big kids" a little bit. But anyone visiting with them as they unveiled the culmination of months of work gained a glimpse into their individual personalities, their passions, and their talents, and saw the beautiful results of their determination. Oh, and that sparkle in their eye when asked to share a bit about how their project came about--that was pretty lovely, too! And the younger children, well, they were just so taken by the work of these big kids, their role models. Congratulations to all! Please click through the gallery to see them all. Grade 8 performed their final class play in April 2018—Romeo & Juliet—at the Plainfield Opera House. 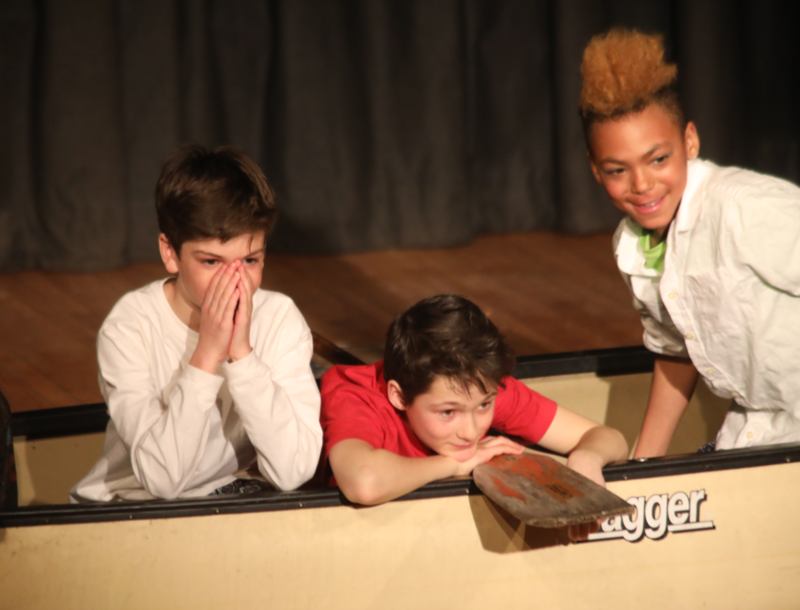 From Class Teacher Libby Case: One of the culminating events of eight years as a OVWS student is the 8th grade play. 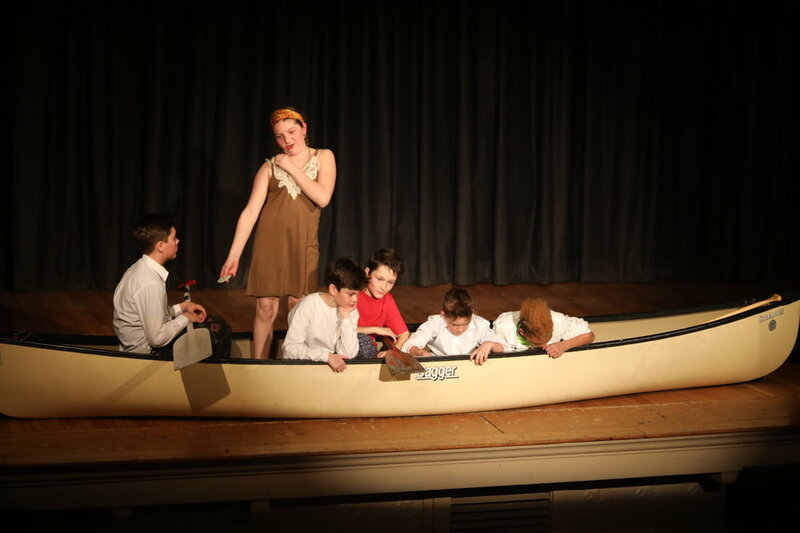 Each year, this class has performed a play that is in some way relevant to the particular curriculum of the year. And each year I am so proud of their production. They are a very cooperative group who have learned over the years to manage themselves both backstage and on stage, and this year was no different. 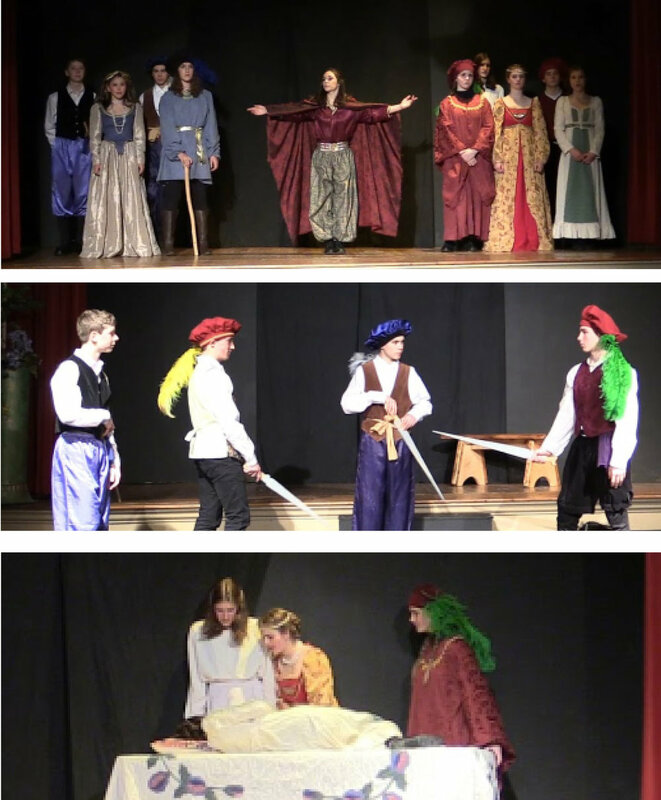 In 8th grade language arts, students are introduced to the poetry and plays of William Shakespeare and the students were interested in performing "Romeo and Juliet" for their class play. Finding a version that was true to the original but manageable for middle school fell to the teacher. Understanding Shakespeare’s beautiful, yet challenging, language was accomplished with the help of parent Erica Zimmerman. A grant secured by our great administrator, Karen Vatz, allowed us to enlist the help of experienced actor and director Morgan Irons as an acting coach, and Shannon Hepburn coached the students on sword fighting. With all that help plus long hours of studying the play, understanding the language, memorizing extensive lines, and perfecting their characters, the students put on a fantastic production that exceeded all expectations! I could not be more proud of their work! We are offering short pieces about faculty and staff in the Apple Core to introduce staff and to bridge our three campuses. This interview was conducted by Mary Fettig. Kelly Davis took a circuitous route on her way to us here at Orchard Valley, and we are so pleased she made that journey! Kelly spent her childhood in Pomfret, VT and then attended the University of Vermont, graduating in 2014 with a B.S. degree in Environmental Science with a focus on Conservation and Biodiversity. From Burlington she travelled out to Washington state, then to Saint John in the Virgin Islands, and finally back to VT, moving to East Charleston up in the Northeast Kingdom. All along the way she immersed herself in work that prepared her for designing and writing the curriculum for the On The Land program which she teaches here at Orchard Valley's East Montpelier Main Campus. Kelly's love of the outdoors and the natural world began as a child. Her parents had a landscaping business that has grown into a farm, and they were always bringing home orphaned or hurt animals to add to their family. Kelly fondly remembers having a "pet"pigeon that lived on their screened porch. As a young woman she worked at the Farm & Wilderness Camps in Plymouth, VT, first in their day camp and then becoming the Program Director of the Salt Ash Mountain Camp, a wilderness skills camp for teens. Through high school friends that had attended Upper Valley Waldorf School, along with Waldorf-schooled campers at Farm & Wilderness, Kelly began to notice the "inexplicable" sturdiness which is a result of Waldorf education. She became attracted to the "mysterious and enchanting" aspects of Waldorf and she allowed that seed to be planted within. After initially declaring Engineering as her major, Kelly soon switched over to Environmental Science and it was at UVM where she was able to tailor her studies towards what she loved; the fusion between agriculture, wilderness, and children. Her coursework now included Tracking, Permaculture Design and Hands-On Learning. Her farming experiences include working with dwarf goats at a dairy farm and farming at the North Country School of Lake Placid, where she also taught students how to farm. It was when Kelly and her partner decided to move to Central VT that the long-ago planted seed of Waldorf teaching began to grow and she made a connection with Orchard Valley. Kelly was hired last year as the assistant in the Farm and Forest Kindergarten. During that year, Kelly was a member of a working group which included parents, faculty and community members that set in motion the development of the On The Land program of which she now is the lead teacher. "On The Land is a wonderful program, and each day is unique. With a season-based curriculum, things are ever evolving--which I love," Kelly says. The Main Lesson teachers have shared their block rotations and Kelly uses those to help plan the themes. In addition, she has developed a school-wide gardening curriculum where each grade will take one component--herbs, flowers, grains, the "Three sisters" (corn, squash and beans), and even a market garden. The children will have the opportunity to get their hands dirty and to delve into real experiential learning. OVWS is also home to four sheep, two goats, and a dozen or so chickens. Kelly has plans to get more students involved with the daily care and husbandry of the animals as part of the On The Land curriculum as well. She also has plans for a student-built chicken tractor. We are so pleased to have Kelly and the On The Land program and wish her a fruitful experience here at OVWS! We hope to offer short conversations between faculty and staff in the Apple Core to introduce new staff and to bridge our three campuses. Here is our first; the interview was conducted by Mary Fettig. MF: Jada, it's great to have some time to sit down and get to know you. Can you share a bit about yourself and the path that led you to this position? JB: I hold a degree in Education from Goddard College in Plainfield, VT. I was in a self-directed program and focused on both Progressive Education and Waldorf Philosophy. I have been teaching since 2000, mostly in Early Childhood Education. Before coming to Orchard Valley, I worked at the Green Valley Waldorf School in Putney. I began as the school cook and Kindergarten Assistant, and ended as the Lead Teacher of the infant-toddler class. When that school closed, I moved back to Montpelier and worked for two years as the Lead Teacher in the Apple Blossom class at the Child’s Garden. When Little Lambs was scheduled to open, I transitioned here. I was inspired by the idea of working in a developing program designed for working parents that focused on the very young. As a child I attended Mountain Laurel Waldorf School in New Paltz, New York. I went on to study Progressive Education, but I have always been drawn to the Waldorf Philosophy. Currently, I am completing my Waldorf Early Childhood Teacher Certification from Sophia’s Hearth in Keene, NH. I chose that program because it is one of the leading programs in this country focusing on the very young child; those from birth to age 3. MF: Please say a bit about this Pikler Method and how it informs the child care at Little Lambs. JB: The Pikler philosophy is focused on building the relationship between the child and their caregiver. One of the main foundations of the philosophy is having reverence and respect for the child, and listening and being aware of their needs. The child is seen as an active participant in their own care. Using the Pikler approach, children are involved in all aspects of their care. By this I mean they are engaged in everyday self care skills such as dressing, eating, cleaning, and even toileting tasks. These all help to build resilience and confidence in the young child starting in infancy. Young children are able to do so many things and they have so many capacities--if we can get out of their way and allow them to explore and learn about themselves and the world around them. Emmi Pikler was a Hungarian pediatrician and pediatric surgeon whose specialty was pregnant women and newborns. After World War II, she ran an orphanage for many years and implemented the ideas that she had developed about infant care-giving and child development there. This form of child care is very innovative, and the Pikler Approach is being adopted by most Waldorf Schools that serve the very young child. Magda Gerber, who trained under Pikler and brought this philosophy to the U.S., said, “When you approach your baby with an attitude of respect, you let him know what you intend to do and give him a chance to respond. You assume he is competent and involve him with his care and let him, as much as possible, solve his own problems. You give him plenty of physical freedom and you don’t push development.” That is what we are doing here at Little Lambs. MF: Tell us a bit about the Center. JB: Little Lambs is located on Country Club Road in Montpelier. This is right across from Agway, off Route 2. The center opened in September 2016. I took over as Interim Director in April and assumed the full position in July 2017. The center currently serves 30 children and we are licensed to accept children from 6 weeks to 3 ½ years of age. We are open from 7:30am to 5:30pm and run year-round. We have three classrooms; one is for infants and the other two are mixed-age toddler classes with children from approximately 1 ½ to 3 ½ years old. Each room holds eight children with a Lead teacher and an Assistant teacher. We also have a few "floater" teachers on staff to help during the busy times of day. We place a lot of focus on outside playtime, and really see the outdoors as another classroom for the children. In addition to our play yard outside the center, we are located near a beautiful natural golf course which is closed from November through April and we have free access to the land, which is quite lovely. There is also a wonderful wooded area nearby where the children often go to play and spend time in nature. We recently received a $5,000 grant from Seventh Generation to improve our play yard and used the grant to purchase several climbing structures, a playhouse/shed, and a special Pikler climber that even infants are drawn to explore. During the warmer months the children are outside most of the day, and even the infants are outdoors crawling and exploring. We have plans to double the size of our playground this spring. MF: Jada, one toddler can be a handful, how do you get eight of them fed, diapered, and down for a nap? JB: Having the children in a cohesive group is helpful, as they support and entertain each other. Our day is very calm and rhythmical, with ample opportunity to go outside. The center is very peaceful and decorated in a simple way with beautiful natural materials. Part of the Pikler approach is to slow down and be truly present with the children. This helps the children feel noticed and respected, which creates a lovely harmonious environment for everyone. The children are also given a lot of time for free movement and this helps them develop their lower senses, bringing both inner and outer strengths. MF: How do you see Little Lambs integrating into the larger Orchard Valley Community? JB: Little Lambs can be a bridge where young families can learn about Waldorf Education and the Orchard Valley Waldorf School. The new parents that I meet are hungry for high-quality child care. They are seeking support, community, and parent education opportunities. They are inspired by the care their children receive at Little Lambs, and this gently welcomes them into the larger Waldorf community. In the last year, seven students outgrew our center and moved on to the Montpelier Child’s Garden and East Montpelier Main Campus. My goal is to build a strong foundation here at Little Lambs that would support the other programs Orchard Valley offers. I am honored to serve in this way. We plan to begin offering workshops, parent education, and other events for young families. There are several workshops that are currently in the planning stages, so please look for information soon. MF: Jada, thank you for sharing this information. It is a pleasure to know you and to see what you are bringing to the very young here in Central Vermont. Class 4/5 Gets Busy Dyeing in Handwork! From Mary Fettig, Class 2/3 Mentor. Mary is a long-time Waldorf teacher working with new grades teacher Laurie Kozar this year, and shares wonderful pieces about the Waldorf curriculum in practice at OVWS in the Apple Core. Three Cheers for King Winter from the Farm & Forest Kindergarten! From Farm & Forest Kindergarten Teacher Michelle Gullage: With the onset of winter and the blessing of having an inside classroom space this year, Farm & Forest children have shifted the beginning of their mornings inside. This has been a welcome relief on some of the bitterly cold mornings that have been on our doorstep! Coming inside has allowed us to fall into a fairly traditional Waldorf Kindergarten rhythm of activity and inside play. Even though we have been inside more than usual, King Winter & Jackie Frost have still found a way to breathe their icy breath into all that we are doing! We've seen icy paintings on our windows, icicles as big as children, and the snowflakes have begun to fall from the wreaths and branches all around our room. Children have been cold, hungry kitties, puppy dog pirates on an icy sea and, of course, the snow plows are out in full force! There has even been time and space for a small group of children to step outside during inside play and do a bit of tracking with Mr. Sean before coming back in for circle. And, as quickly as snow fairies fly, we eat snack and spend almost two full hours playing in the farmyard and going adventuring out in the snow! Wintertime is always a delight for the young child. When properly dressed, good friends and a blanket of snow is all that we require! Three cheers for King Winter--Hip Hip Hooray, Hip Hip Hooray, Hip Hip Hooray! "Darkness cannot drive out darkness; only light can do that. Hate cannot drive out hate; only love can do that." ~ Dr. Martin Luther King Jr.
From Grade One Teacher Svenja Donlon: In celebration of Martin Luther King Jr. Day this year, the students of Orchard Valley Waldorf School embarked on a day of learning, celebration, and spreading of the light and love embodied by this great man and the countless people who have fought, and continue to fight, for racial and social justice and equality in America. Main Lesson: The day began with main lessons tailored to each grade. In the first grade, we discussed the unkindness and unfairness people of color experienced and still do experience in America. We talked about what we can do to ensure we treat everyone around us with kindness and respect, and to judge them by the content of their character and not by the color of their skin. We learned that this was what Martin Luther King Jr. dreamed of for his own children and for all the people in America. We drew a picture of his dream. During morning lesson in classes 2/3 and 4/5, students heard about the life of civil rights leader John Lewis. He is the last person who spoke at the March on Washington and is still alive today, serving in the U.S. House of Representatives. It was important for the students to hear that this work isn't behind us. There is still a lot of work to do before we can achieve a true sense of equality in this nation. In grades 6 and 8, students heard an in-depth biography of Martin Luther King Jr. and learned about the work for the poor and oppressed that he began during his lifetime. 1st and 2nd Period: After recess, we gathered as a school for a time of celebration in the Yurt. The 8th grade students recited some of Martin Luther King Jr.'s "I Have A Dream" speech, and class 4/5 sung 'This Land is Your Land, This Land is My Land." We were then fortunate to have Judy from the Good Samaritan Homeless Shelter in Barre speak to us about the work of the shelter and about Martin Luther King's work in the "Poor People's Campaign." She shared how she remembered being moved to tears when she saw Martin Luther King Jr.'s "I Have a Dream" speech live on television. OVWS Chorus and Violin Teacher Katie Trautz, along with Heidi Wilson, then led us in songs of protest and freedom from Martin Luther King Jr.'s time and some written since, such as "We Shall Overcome" and "I Woke Up this Morning with My Mind Stayed on Freedom." We learned how many of these songs started as gospel songs sung in churches and how the words were changed to become songs of protest. We learned about the solidarity singers in Montpelier and their work supporting social justice protests. Heidi explained to us that these are not "Mary Had a Little Lamb" songs to put people to sleep! Rather, they are powerful songs, sung to bolster the spirits of those who sing them and hear them, and they are sung to make people sit up and listen. It was an inspiring experience to sing as a school and to hear the power and courage of these songs. 3rd and 4th Period: In the afternoon, we worked in multi-age groups to make beef stew, apple crisp, oatmeal-raisin cookies, and notes of welcome and kindness for the Good Samaritan Homeless Shelter. We learned that this is a way to honor Martin Luther King Jr. and the light and love he radiated and inspired in our country. It was a day of challenge, celebration, and inspiration. It was a day to remember that learning about racial and social injustice and the work needed to create a more just society must continue through this year, in this place, in this country and in all our days and places yet to come.